Welcome to Day 6 of our unofficially titled “12 Non-Holiday Films for the Holidays”. For 12 days, we are showcasing 12 amazing non-holiday themed films for those of us who despise holiday films or the whole damned season altogether. Enjoy! I was quite honestly a bit put off at the concept of the film. I have an obvious prejudice towards that fancy little “YA” label. Whenever I know that something is attached to the Young Adult model of art, I feel as though I should automatically refrain from partaking in any sort of viewership. But, as I tend to be from time to time, I was completely wrong. I knew the cast of the film seemed pretty amazing, and are folks that I have enjoying in very different types of roles. So I took that little bit of hope, and dug into Kepler’s Dream. And I was not disappointed. This was a fantastic film on several different levels. The subtle yet vast & natural back drop that only a place like the American Southwest can provide plays a key factor in the serenity of Kepler’s Dream. The rolling hills lay gently over the lengthy, grass-patched desert and can be very overwhelming for those who may be used to much more abrasive and in your face types of scenery. While I adore the mountains and trees of the great Northwest, sometimes the beauty that lay within the desert can be just as overwhelming. I strongly believe that Kepler’s Dream taking place in ‘The Mud Hut” within the borders of New Mexico is a huge factor in the success of the film. The desert will always create its own character in whatever film it will appear within. This is just fact. But, as we often do here at Trainwreck’d Society, we must acknowledge the tremendous performances I was so fortunate to witness. Obviously Holland Taylor is a damned delight. She is a natural wonder of the screen who seems to only have an A game when she appears in anything. Kelly Lynch, Sean Patrick Flannery, and Michael Quezada, are also some amazing actors who could have really phoned it in for this little film, but they absolutely did not. They were charming, impeccable, and proved that they are masters of their craft. Now let’s talk about the real performance that everyone should recognize as a shining achievement. And that performance was given by the very talented actress in the leading role known as Isabella Blake-Thomas. I will admit, I was unaware of this young lady until now. Although she seems to have been working since the day she was born according to her credits. Isabella’s performance as Ella was absolutely spot on, and a delight to watch. It’s hard to not nail that child like wonder, when you are indeed a child yourself. But, the ability to project that emotion to a screen is an accomplishment in itself. And I dare say that Isabella Blake-Thomas is an actress who will only continue to impress us as she moves forward. Kepler’s Dream will be but a distant memory in her growing list of credits, but we will surely remember her brilliance at this time. Go ahead and see the film folks! 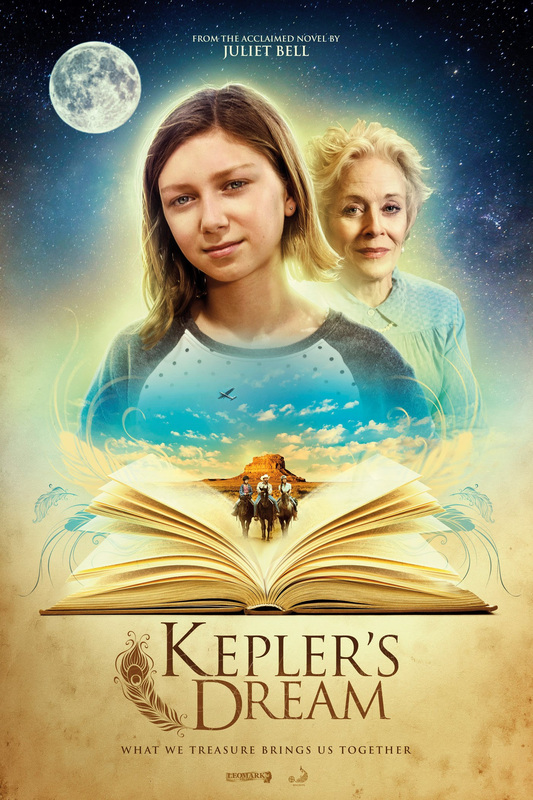 Kepler’s Dream may be an adaptation of a “Young Adult” book, but it is truly an inspiring tale from Juliet Bell, no matter what audience the story is geared towards. Watch it with your daughter, or niece, or son, or whoever if that makes you feel better. But honestly, it is just a heart-warming tale that you are going to thoroughly enjoy. It is a tale of wonder and mystery set against a lovely desert background. There really is so much to love here!